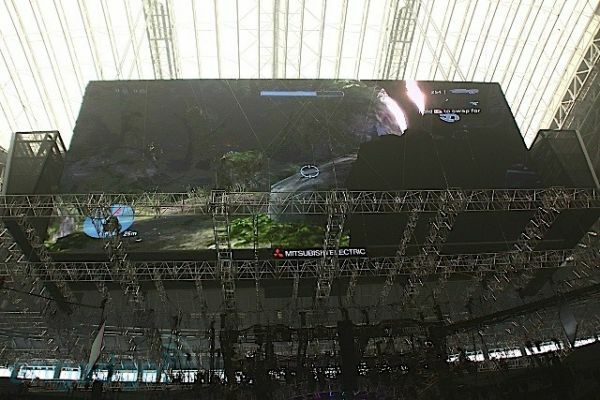 The new Dallas Cowboy's stadium sports a state of the art 72x160 FOOT screen. To put it another way, in say - living room HDTV terms - that's a 864" by 1920" television. The Cowboys monitor though is no ordinary HDTV, it's a state of the art LED screen capable of displaying instant replays, concert footage and now Xbox all in glorious hi-definition. While setting up for a upcoming concert, the video director for the Jonas Brothers figured it'd be a good time to test out the screens capabilities. Both Gears of War and Halo 3 were on display. I guess I wouldn't mind playing some split screen if I get a full 960 inches on my side.